Say you have a pool in your backyard, and with summer coming round pretty soon it is time to jump in for a dip with that hottie you’ve picked up the night before. Why not make the entire experience more fun with the Two Person Water Lounger? This is the inflatable 7 1/2′ diam. water lounger that allows two people to relax comfortably head-to-toe, facilitating conversation. 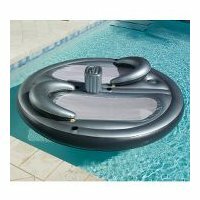 It is made of durable 0.3 mm thick PVC that will withstand exuberant play, and has a removable, inflatable cooler located in the center of the craft that holds up to six 12 oz. cans of your preferred beverage and ice. A cup holder built into either side of the hull provides a convenient place for a drink, swim goggles, or sunglasses. Two inflatable, removable pillows snap onto the hull and remove easily. The lounger inflates in minutes using the included manual air pump; deflates quickly and stows unobtrusively for off-season storage. Just watch your weight though, as this can support a maximum of 350 lbs. The Two Person Water Lounger will retail for $129.95.